I have been with House Values for 3 years now. During the first year the commissions I generated from HV leads were about twice what the leads cost me. Ok, but certainly not exciting. In the second year, the commisions were 10 times the cost of the leads. Now we're talking. And this past year, the commissions were 20 times the cost of my leads. WOW! House Values is now my main source of new business, and past clients make up the rest. In addition, I have been able to dramatically reduce both my advertising and mailing costs. In fact, I spend less now to generate business than I used to, and that includes the cost of my HV subscription. The increase in my HV business demonstrates that the internet consumer is not always motivated to act quickly. Here's a prime example. In September, 2007 I had a call from a prospect who requested a CMA in March of 2005. Because the CMA was for a cottage rather than a principal residence, I was unable to locate or find a phone number for this customer. I just left him on the drip campaign for Long Term Seller followed by the Email farm campaign. When he called me, all he said was that he was ready now. No question of him even interviewing anyone else. I double ended his cottage at $450,000 in 2 days, and double ended a cottage owned by the buyer in two weeks. This is a great system made easy with drip campaigns to help you keep in touch with past as well as future clients. Your staff in training, customer care, and accounts have been very supportive and helpful. There may not be a magtic bullet for Realtors, but for me, this is as close as it comes. Best wishes to everyone at House Values for a fantastic 2008. 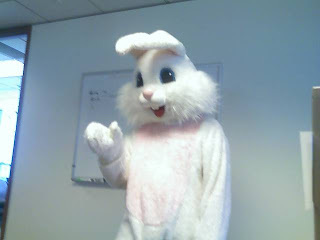 Earlier this afternoon, the HouseValues office in Kirkland had a visit from a Big Bunny! He was followed by HR staff handing out chocolate eggs and mini-carrots. HouseValues Success, in their own words! WOW, check out these great customer audio testimonials! Just click the "play" button on the Hipcast.com bar below, and make sure your speakers are turned on. We recently completed production on a new customer video that showcases successful HouseValues customers from across the country, all talking about the three most important factors that have contributed to their success. They plan. All of them think about their business long-term, and develop a business & marketing plan to help them achieve their long term professional and personal goals. They systematize. All of these successful agents use systems to put as much of their business on autopilot as possible, freeing them to do what they enjoy most. They innovate. Every successful agent is constantly learning, often from other successful agents, and innovating how they do business to keep their edge and continue growing. Less than a month ago subscriber Lee Gumms signed up with HouseValues. He started with only 6 Listing Leads a month, within the first 3 weeks the first lead he received closed for $440,000 bringing in a commission of $17,000…. WOW!!! Not only that but he has 2 more going to escrow for a possible total commission of $51,000 in his first 2 months. Needless to say Lee is very happy about his decision to join HouseValues. Five years ago Pam Phillips started to build a long term pipeline with her HouseValues system and leads. Since then, she has made more than $120,000 in commissions (averaging between 15-30 transactions a year). She depends on 50% of her business coming from HouseValues and she actively promotes other agents to join HouseValues! Amy McLeod says she's doing just fine with our service but sales team lead Maureen Francisco says she's doing more than just fine. Amy depends 25% of her business through HouseValues. Last year alone, she received 10 HouseValues listings and some of those leads went onto become buyers. Amy has made more than $60,000 in commission with her HouseValues system and leads!!! Subscriber Terri Cassesse signed up with HouseValues on Jan 17, 2007. She got her 1st listing her first week, 2nd listing the 2nd week, skipped a week and then got the 3rd and 4th the next week. She is also signing 2 more listings this weekend. That’s almost a listing a week! Terry is ecstatic with her HouseValues system and leads in addition to the wonderful HouseValues sales and service teams! HouseValues subscriber Helen Klopp closed 5 transactions in 2006, her first year with HouseValues and JustListed for $1,705,400 in gross sales from HouseValues and JustListed leads. One sale (the largest, at $469,900) was from a referral she received from a HouseValues lead! One of these transactions she closed in her first month! She has made $27,800 in gross commissions from HouseValues leads in 2006. All this from an investment of $2,800.00 which translates into a 992% ROI!!! Needless to say, Helen loves the Market Leader system and is ecstatic with HouseValues! Subscriber Shannon Pilon has revealed herself as the HouseValues hidden success of Canada. In only a year and a half Shannon has closed 12 transactions from her HouseValues system and leads. Since January 2007 she has closed 4 deals from our leads. She has only been in Real Estate for a little more than two years but her dedication to working Market Leader and personal follow up has paid off!! HouseValues subscriber Aaron Kerper recently shared his 2006 success with Yakima customer care representative Andrew Watson. In one year Aaron made over $100,000 in commissions and between $70,000 and $80,000 came from HouseValues! Way to go Aaron! Homepages subscriber Linda Burns has been with us for almost a year and the fruits of her labor are beginning to pay off! This winter she closed 2 sales in November, 1 in January and another 1 in February! That’s 4 transactions in her first year! Linda says that patience is the key, and understanding that you just have to stick with it. She says she does not know what she would do without us, and loves the success she is seeing! First deal– received Sept 22nd, and closed Feb 23rd – resulted in a $245K sale. Second deal– received Dec 30th, and closed Feb 8th – resulted in a $250K sale. And yet another deal on Jan 24th, put contract on house on Feb 11th, and it’s due to close early April. Result - $445K home sale. = $31,750 – total commission since coming on board in September 2006!! Sean has several more leads in process, expecting to close many of these as well. He’s extremely happy and speaks very highly of Market Leader – he likes that it makes the agent accountable - it gives him the reminders and supports him in tracking and following up with all his prospects regularly. As well, he says the emails campaigns are absolutely great, along with the ability to customize them. Things are heating up in Illinois despite the cool weather! HouseValues subscriber Jason Bacza called in to customer care to learn about some new feature in Market Leader yesterday. Jason expressed his gratitude towards HouseValues countless times to customers care representative JanNell Hancock. He is highly impressed by his recent success as he has already made $25,000 this year off his HouseValues leads. Jason LOVES the Market Leader system and the responsiveness of the support network behind it. "Thanks to Market Leader .."
HouseValues subscriber Wayne Ellis in the Silverdale, WA market joined the HouseValues family in August of 2006. Wayne is in the process of closing a $300,000 house from a JustListed lead. Wayne will make $7575 from that closing. He also shared he is working with several buyers. He says he gets a lot of prospects from out of state. JustListed subscriber Kevin Curtis says "Market Leader Rocks." He loves the follow up campaigns and the features that are available with our system. He says thanks to Market Leader, he did 24 transactions in 2006 because he put his entire sphere of influence into the system. The success he's seeing through Market Leader has helped his team be #1 in his company. In addition the has four more transactions in the works for 2007! HouseValues subscriber Patricia Lewis recently attended one of our seminars where she chimed in to share her success with our service. Last year she had to take a 4 month break and was in and out of the hospital. Her business partner could not keep up the load as they had too much business for just one person. She said with out Market Leader they would not have been able to keep track of all of their leads. They made $65,000 commission off our leads in spite of her health issue and this year to date have made $50,000 and that is just the tip of the iceberg! It might be cold in Alberta, Canada but the cool weather has not stopped HouseValues subscriber Bob Macaulay from reaching his goals with his HouseValues system and leads. Bob has closed over 7 transactions in 9 months from 13 leads/month subscription. He is so busy he told his sales representative that he can’t keep up with all the business he is getting from HouseValues! – Bob made 50% more money last year than the year before because of his HouseValues service. In addition he is looking to add an assistant to help him work his leads so he can spend more time closing deals! Margie Williams – Springfield, VA is closing an $800,000 deal next week with a lead we sent her. She said she just worked the system the normal way and he turned out to be a good one. She will be making around $24,000 in commissions on this deal which will pay her subscription out another 24 months! She really likes the system and leads! “I started with the HouseValues program in early January this year. Like you I need to invest wisely what little money I have. I believe I made a good choice with House Values. My goal this year was to get my name out and keep "in their faces". HouseValues has some really neat programs within its system to do just that! I actually got a listing from a friend that had forgotten I was in real estate until they got the email drip. I got another listing because I showed them "added value" of advertising their home on an additional web site besides the ones the Danberry offers. There are multiple forums, email campaigns, additional learning tools, databases available so it is not just about the leads. I'm finding the whole thing quite good. JustListed subscriber Patty Manns out of Buffalo, NY will “double end” her first lead! Patty started her subscription on 1/24/07 and responded right away to her first lead. The lead was still online and the prospect called her right away at her office. She was a buyer lead however; they needed an agent to sell their home so they listed the home that same day for $144, 900 and now she is showing them homes and about to close on a home as well! Patty is also working with another lead and she has been with us less than a month. In one month’s time, she has become a self-proclaimed promoter and has already referred another agent and they are a subscriber now as well! Erik Barthel a loyal HouseValues customer since 2002 knows working with lead generating companies is a numbers game as well as consistent follow-up. Erik currently is receiving 50 listing leads a month, and works all of them himself! In 2006, he went on 53 appointments from his HV leads, and listed 22 of them. Out of the 22 listed in 12 months, 11 of them turned into a transaction. He spent roughly $12,000 with the company last year, and in return received $36,000 from his HouseValues leads. That’s a $24,000 profit for 2006!! Joseph Dorr a HouseValues subscriber out of Ocala, FL has been with HouseValues since September 2006. He just got another listing for $485,000! This specific lead has yielded 2 transactions for Joseph over the past 5 months. In addition he had 2 other transactions in this time frame. That’s 4 transactions on only 5 months! Transactions with this lead and a previous lead have resulted in four transactions with HouseValues leads. This is only the beginning for Joseph as he has a handful of other potential transactions in his pipeline from HouseValues. So far, he’s made about $19,000 in commissions from his HouseValues subscription!! How long does it take for your marketing to work? John Jantsch does a great job putting this question in perspective in his Duct Tape Marketing post earlier today. We coach agents to continuously be on the lookout for prospects to import into Market Leader. This great coaching advice paid off for Tonia Mann on a recent flight to Washington D.C. (where she was traveling to film a HouseValues video). Tonia captured two leads just by wearing her real estate name tag on the airplane. Even more powerful, her success story convinced the rest of the agents at the video shoot to do the same. Jerry Guire out of Honolulu, HI has been a HouseValues subscriber for about 7 months. Jerry called his sales rep Pat Peters yesterday raving about HouseValues as he has just secured his 1st listing for $750,000. He said that he also has 12 buyers he is communicating with that he is confident will close before the end of the year and another that is flying in to view homes in the $1,000,000 price range. Judy Germain started with HouseValues at the beginning of this year with subscriptions to JustListed. She already has two sales from her buyer leads, one at $360,000 and one at $249,000 (a total of $609,000 in sales)! To obtain these transactions, she said she’s been responding quickly, using a methodical approach, adding a lot of personal touch in her interactions with her leads, and making sure she’s available when they need her. She’s a new agent and is going to organize her entire business around Market Leader. She’s very excited! $582,000 In Sales After Two Months With JustListed! Mary Ortiz at Long & Foster in Chesapeake (Norfolk market) signed on with JustListed in December of 2006. Since then she has closed two deals, one for $187,000 and one for $395,000 for a grand total of $582,000 in sales! She also has a number of other prospects from us currently looking for properties. In addition Mary is already an active HouseValues promoter! She has already sent in one referral in addition to shouting HouseValues from the roof tops in Chesapeake to all her real estate friends!